This breakfast Ham and Cheese Croissant is outstanding. 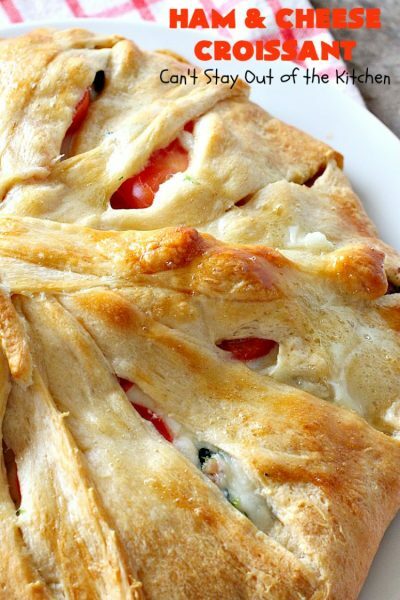 It’s made with crescent rolls so it’s a lot easier than making homemade dough from scratch. 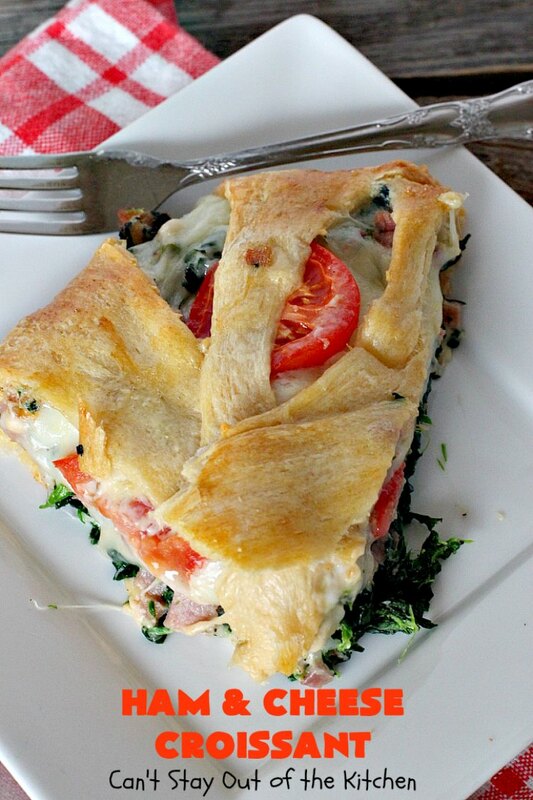 The filling includes diced ham, Swiss cheese, spinach, onion and tomatoes. It’s the perfect breakfast dish for holidays or company since everyone always loves it! Back in December we had a “Breakfast For Dinner” night with our Friday night care group. I had been wanting to make this recipe for years and finally had an occasion to serve it. I cooked up a spiral cut ham the week before Thanksgiving and froze all the leftovers. 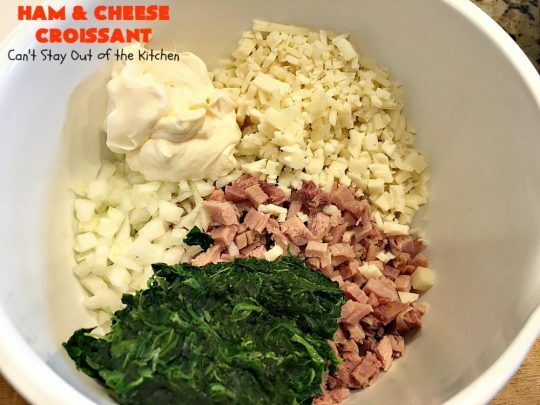 I made up a Ham and Scalloped Sweet Potatoes, a Navy Bean Soup and this delicious recipe with the ham left over from that potluck. I got rave reviews over this recipe. Everyone LOVED it! Bar none. The Swiss cheese melted on top made it gooey and cheesy which elevated it in everyone’s opinion. It’s just one of those recipes that you enjoy eating. Years ago, I served on the school board at our church’s Christian school. We were having a Saturday breakfast meeting and the Headmaster brought this fabulous entree. She made quite a few things that morning and everything was gobbled up pronto! I tracked her down for the recipe and had it in the email section on my phone for a long time. I forgot about it. Then, about six months ago, when I was going through old emails and deleting them, I saw the recipe and made sure it got into my cookbook. This is not a recipe you want to forget about. 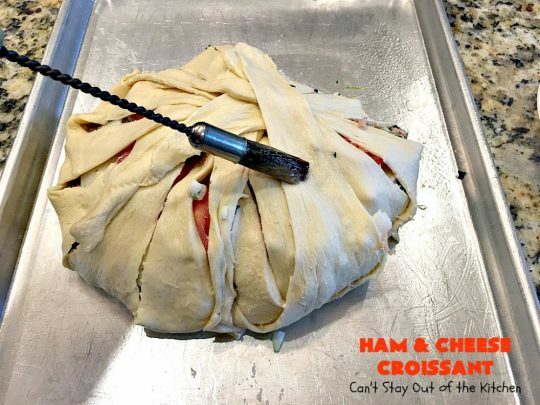 Ham and Cheese Croissant is so good that it should be made frequently! I do recommend that you do your level best to squeeze all the water out of the spinach before you make it. I pressed the spinach through a colander. Then, I squeezed it again in my hands before I was satisfied that most of the water was removed. Otherwise the recipe may get soupy. 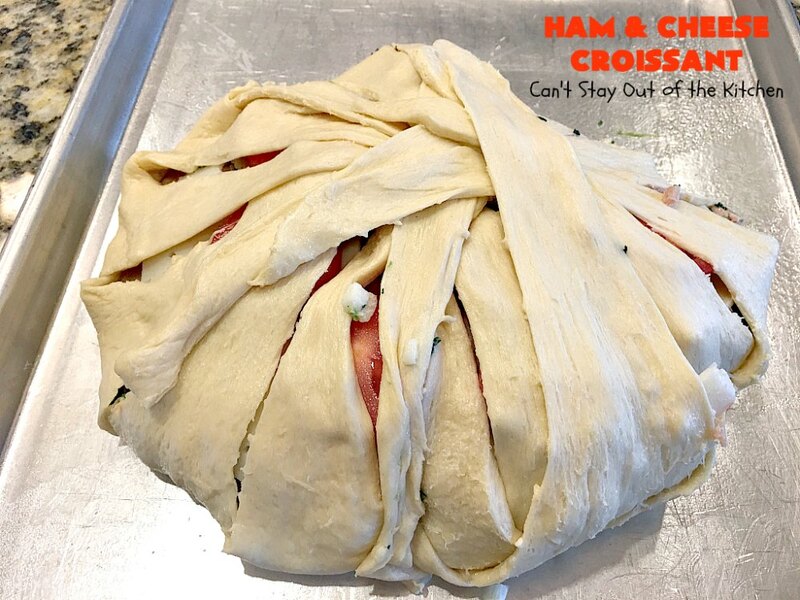 I highly recommend Ham and Cheese Croissant for holidays–especially Easter or Father’s Day. Since it’s got a lot of protein guys really like it. That was sure the case when I served it a few months ago. 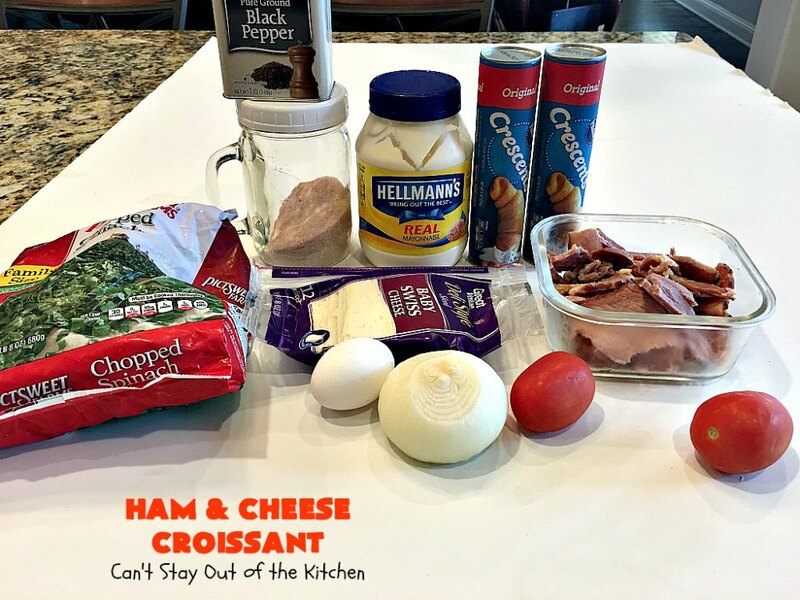 Give this Ham and Cheese Croissant a try and you’ll see what everyone was raving about too. 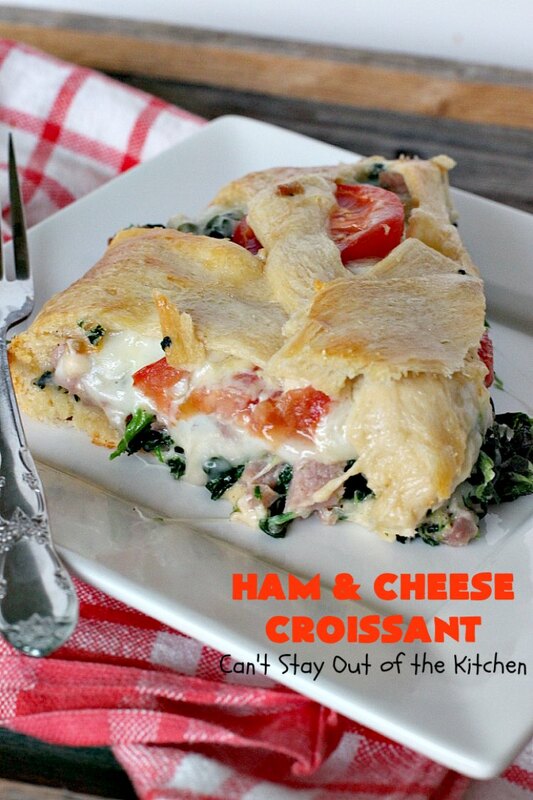 Ham and Cheese Croissant is the perfect breakfast croissant for company. Every bite of this croissant is mouthwatering. This side view shows you how cheesy this Ham and Cheese Croissant is. Reserve about 5 slices of the cheese for the top. Dice up the ham and remaining Swiss cheese in very small pieces. Add onion, mayonnaise, salt, pepper and thawed spinach that has the water squeezed out of it very well. Stir ingredients with a spoon to combine really well. 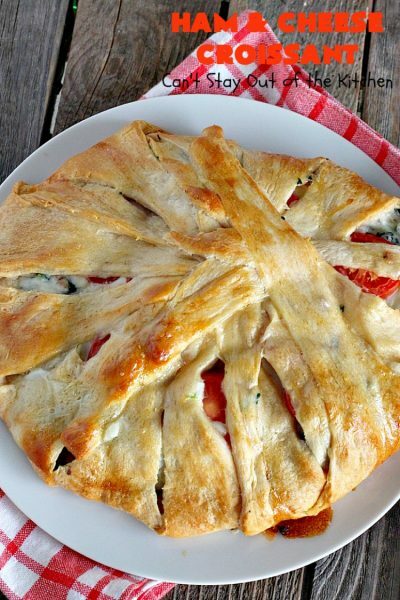 Unroll the crescent rolls into triangles. 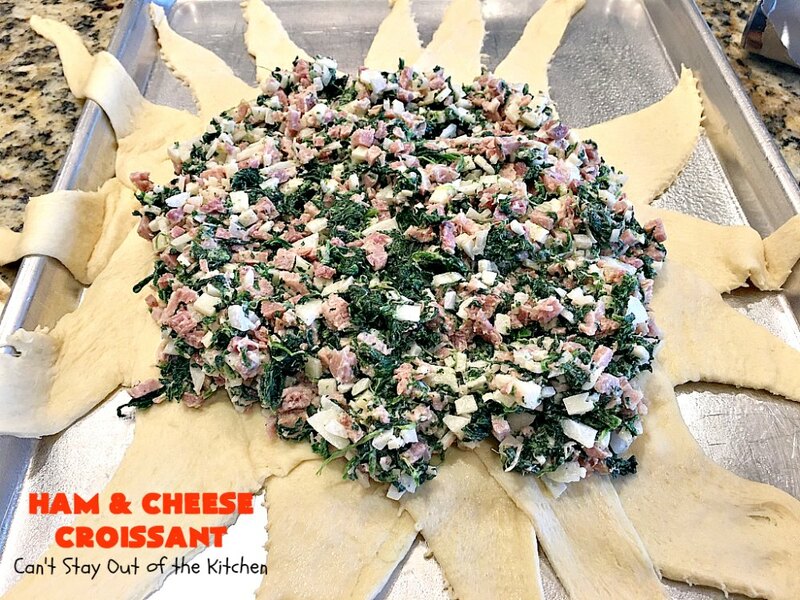 Place on a greased cookie sheet overlapping the dough almost like a sunflower. 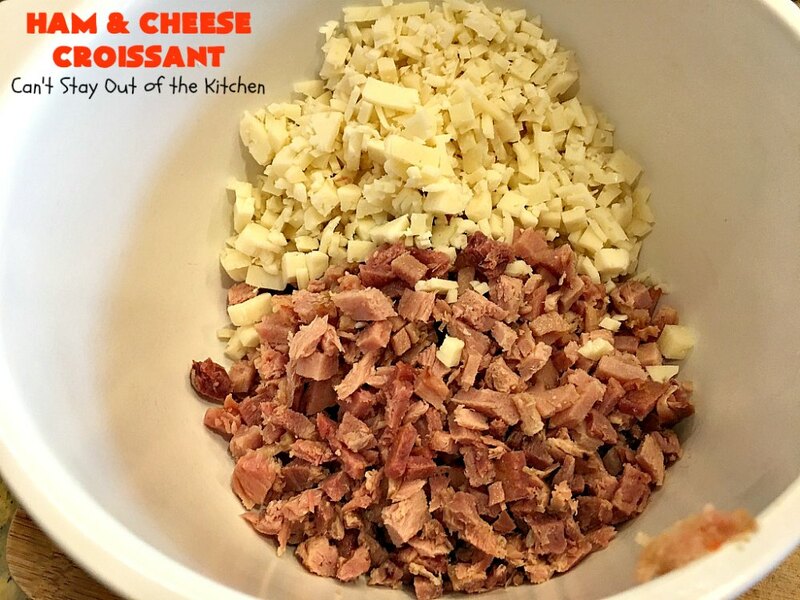 Heap the ham mixture into the center of the dough. Place remaining Swiss cheese slices on top of the ham mixture. Place sliced tomatoes on top of the cheese. Wrap end pieces of crescent roll over top in rotating fashion so the dough overlaps slightly. Brush egg white on top of crescent roll dough. Bake at 350 for about 45 minutes until golden brown. 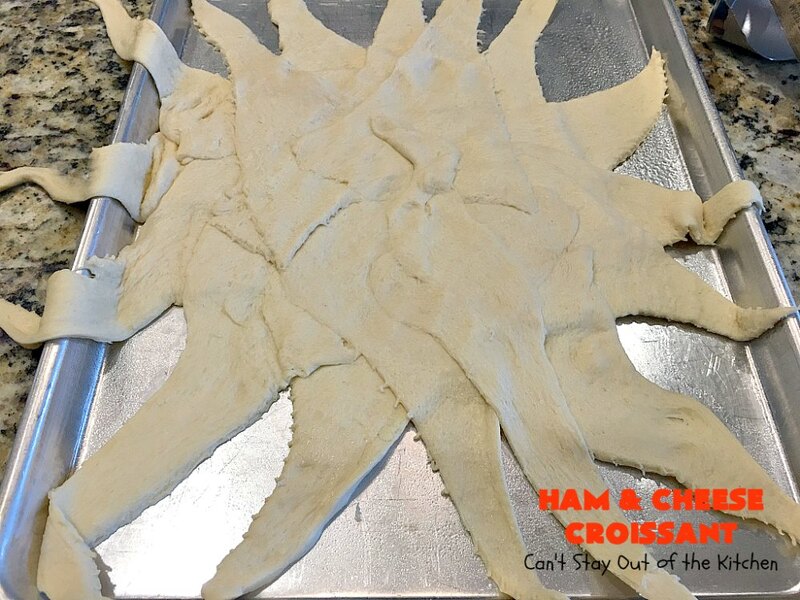 Cut croissant into about eight pieces for serving. 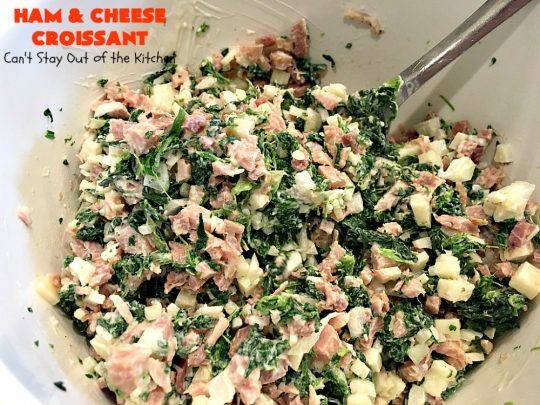 The melted cheese on top of the ham mixture adds cheesy, gooey deliciousness to this breakfast entree. Ham and Cheese Croissant is great for holidays like Easter, Mother’s Day and Father’s Day, along with holidays like Christmas or Thanksgiving. This amazing Ham and Cheese Croissant is filled with ham, Swiss cheese, spinach and tomatoes. 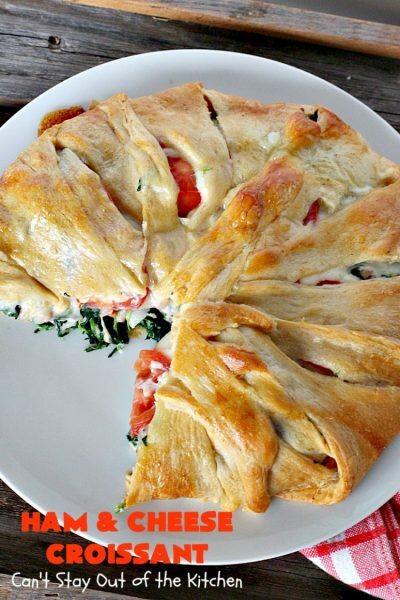 It's cheesy and gooey and rolled up in crescent rolls making it super easy and delicious. It's terrific for holiday breakfasts. Dice ham and all but five slices of the cheese very fine. Put mixture into a large bowl. 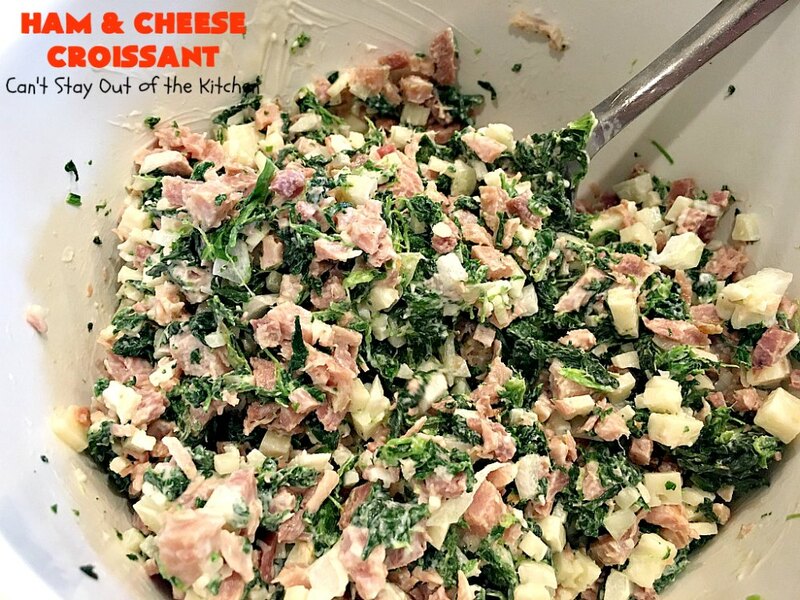 Add chopped onions, spinach, mayonnaise, salt, and pepper. Unroll crescent rolls and overlap to form a circle with long narrow part of the crescent away from the middle. (It's shaped like a sunflower). Arrange meat mixture in the center. 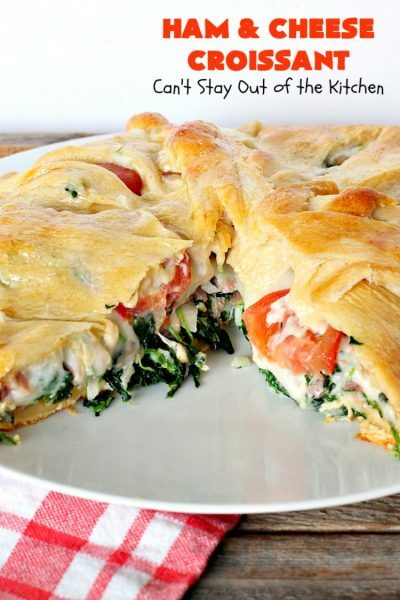 Layer cheese slices on top. Place tomato slices on top of cheese slices. 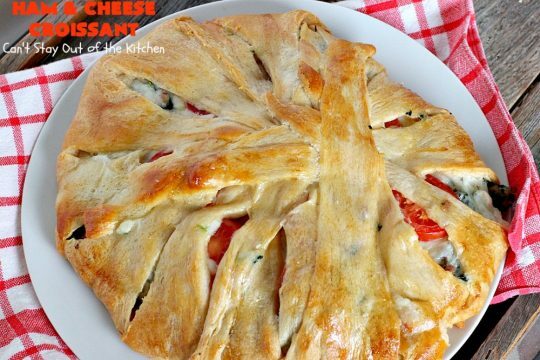 Pull crescent dough over and tuck inside the croissant. Bake approximately 45 minutes or until golden brown at 350°. 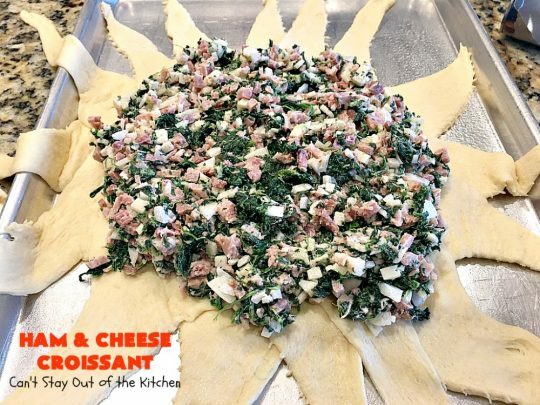 NOTE: You must squeeze as much water out of the spinach before using or the croissant will be soupy. 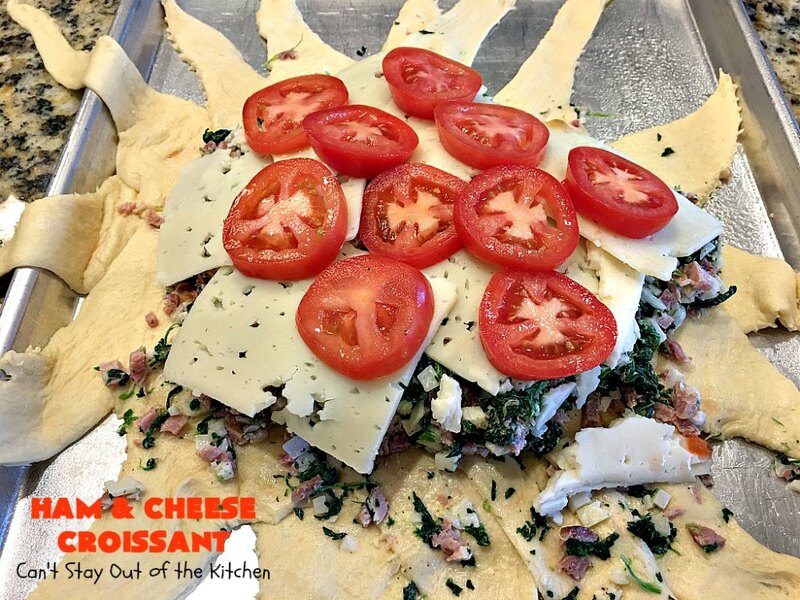 This delicious croissant will have you salivating! 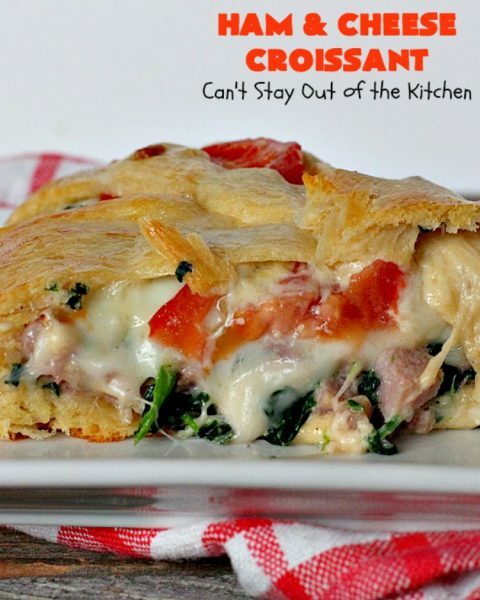 Give this croissant a try and your family will be raving about it too! 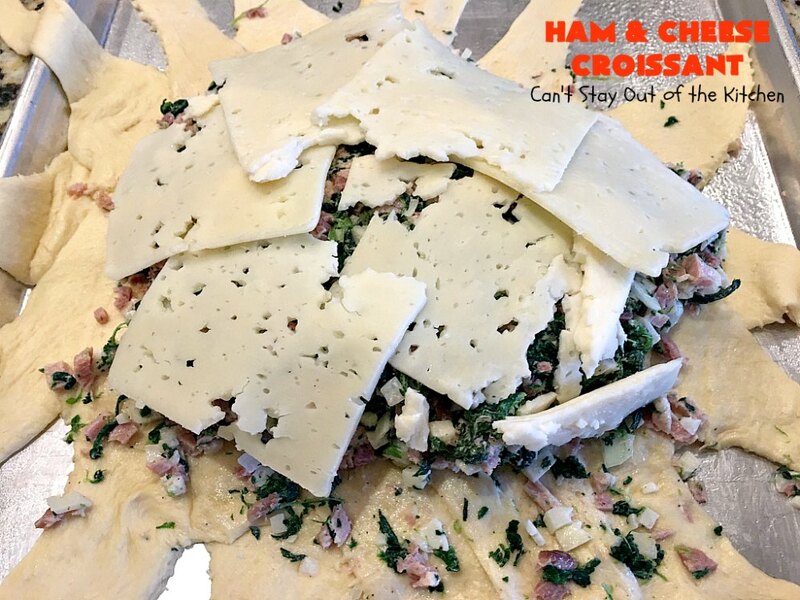 Enjoy Ham and Cheese Croissant as part of a great country or weekend breakfast. 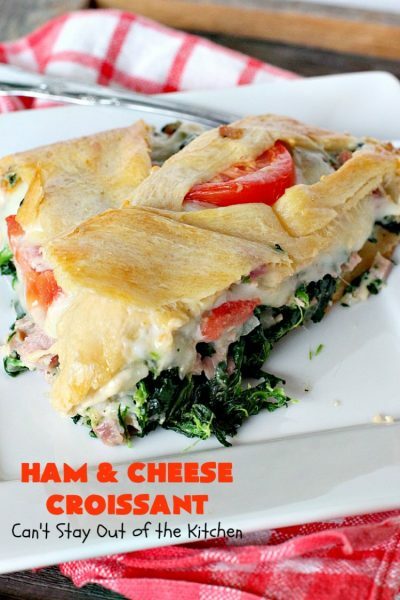 Can not wait to try these recipe, they look delicious. Thanks for sharing your amazing recipes. The ham has to be cooked or uncooked, please let me know.